Local firm Titan Development, along with Atlanta-based Robinson Weeks Partners, will be adding a fourth, 187,000-square-foot building to the park, which will be intended for multi-tenant use. The light industrial building will feature glass for natural lighting, 30-foot ceilings, a rear-docking truck court with trailer parking and extensive car parking. 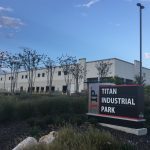 The Titan Industrial Park will consist of seven buildings and 1.9 million square feet of space when fully built out. The site sits next to a warehouse owned by Caterpillar and behind the Amazon Fulfillment Center in Schertz.